Msgr. 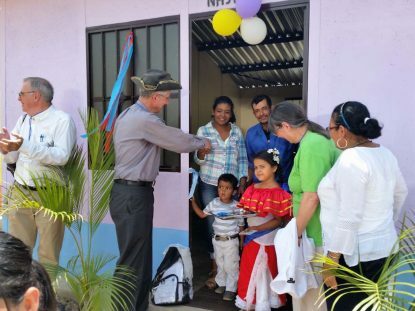 Francis Schmidt (right) and a resident of a village in Nicaragua cut the ribbon on the latest project of Father chuck’s Challenge to provide homes for needy families. San Francisco de Javier, San Augustan, San Patricio, Santa Teresita Nino de Jesus, San Eleanor, Corpus Christi. It sounds somewhat like the string of California missions founded by St. Junipero Serra that are now bustling cities and towns. It is actually a string of villages of colorfully painted houses in the highlands of Nicaragua, built for the very poor and mostly named after parishes in the Archdiocese of Philadelphia. It all started just a bit over 10 years ago when Msgr. Frank Schmidt, on the verge of retirement as pastor of (the now former) St. Augustine Parish in Bridgeport thought to himself, wouldn’t it be nice to raise a little money, maybe $30,000 or so, in memory of Father Chuck Pfeffer? Years earlier Msgr. Schmidt ran a highly successful youth program for the Archdiocese of Philadelphia. Chuck Pfeffer was one of his protégés in CYO who grew up to become a priest and eventually became head of the Catholic Youth Department himself. But Father Chuck died suddenly in 2004 at age 52, way before his time. 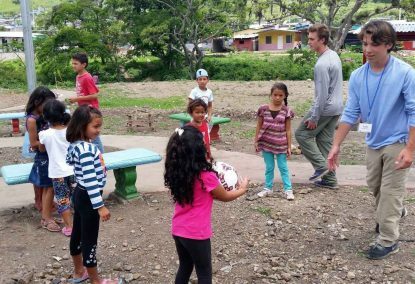 George and Luke Celentano of St. Patrick Parish in Malvern play soccer with children in Holy Family Community, Nicaragua, during a trip there in 2016. Father Chuck was interested in social justice, so why not, Msgr. Schmidt reasoned, raise money to alleviate poverty in the third world? That initial goal of $30,000 has ballooned to $5.8 million and counting with more than 1,100 desperately poor families living in sturdy little houses they own free and clear, something that was beyond their wildest dreams. It is all because Msgr. Schmidt was wise enough not to try to reinvent the wheel. He would raise the money and rely on a reputable agency that had the expertise to put it to proper use in the countries with needs. A priest acquaintance told him about Food for the Poor, a Florida-based agency that has an annual budget of more than $1 billion and works through Christian social justice principles on poverty issues, mostly in Central America and the Caribbean. At its beginning in 1982 Food for the Poor focused mainly on food security but has branched out into other areas including housing and providing the means for the people to become self-sufficient. Just as important, Food for the Poor has the top rating — four stars –from Charity Navigator, the impartial agency that rates most charities. Because of its very low overhead costs, virtually all money raised is actually spent in the mission. Msgr. Schmidt was aware that Food for the Poor hires retired priests and ministers to visit churches to raise money by talking about the mission. But he chose not to be a paid representative, but just a promoter for Father Chuck’s Challenge and negotiate with Food for the Poor as to where the money would be spent. It has worked well for both. “Thanks to the beautiful relationship we have had with Father Chuck’s Challenge over the last 10 years, help is reaching a segment of people who were living in dire, and in many cases, inhumane conditions,” said Angel Aloma, executive director of Food for the Poor. “Msgr. Schmidt is an amazing human being who sincerely cares about the poor and he understands that fulfilling their physical needs is an important step toward meeting their spiritual needs. In the beginning Msgr. Schmidt relied heavily on friends in the priesthood or built up over the years in youth ministry and parish ministry. He especially credits the hard work of volunteers who did the behind-the-scenes work with mailings, passing out pamphlets and all the other tasks needed for a successful fund drive. Especially vital was Connie Hunt, a volunteer from St. Ignatius Parish. 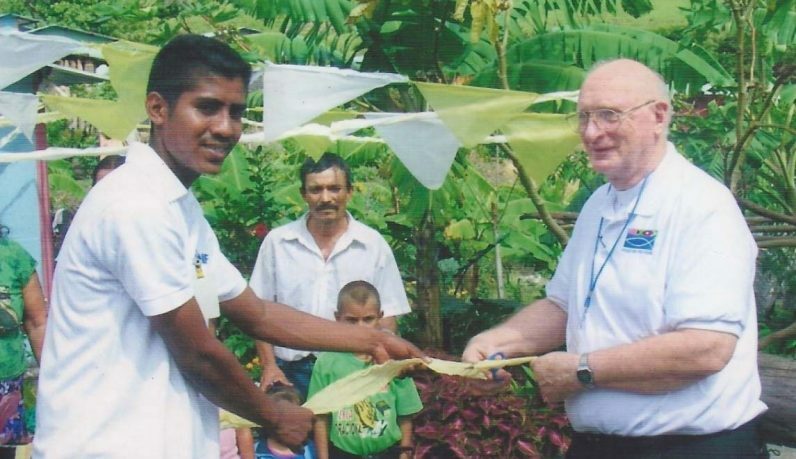 Father Charles Kennedy applauds after Deacon Peter cuts the ribbon on a new home in Jicaro, Nicaragua. The earliest project was a village for little three-room houses in Jamaica, but in the end it didn’t happen because of problems in obtaining the necessary land. Now there are 18 villages in Nicaragua, the second poorest country in the Western Hemisphere, and three villages in Haiti, the poorest country in the hemisphere. By American standards they aren’t much — a living area and two bedrooms built from concrete, with a concrete floor and corrugated metal roof. Running water is supplied usually through an outdoor faucet and each house has its own outhouse. Some of the houses do have electricity, usually supplied by solar panels because the remote locations do not have public utilities. Simple furniture including beds, tables and chairs are also supplied and most houses have ground for a vegetable garden. Most are also supplied with tools, chickens and chicken coops and perhaps other livestock. All of this is at absolutely no cost to the new owners who in most cases were squatting on land they didn’t own, living in crude dirt-floor shacks with a tarpaulin for a roof. One factor that has kept the costs of the houses down in Nicaragua in some cases is a partnership with matching funds from the American Nicaragua Foundation, another charitable foundation with a Charity Navigator four-star rating. In Haiti the emphasis has been on coastal fishing villages where in addition to houses the residents have been supplied with fishing boats, gear and storage facilities. It is a testament to the sturdy little houses that after a recent hurricane that wreaked havoc in Haiti — where hurricanes and earthquakes are all too common — the Food for the Poor houses were practically unscathed. One of the ways Father Chuck’s Challenge keeps interest going in the project is through inviting donors to join in progress trips, at their own expense. It is really an eye-opener and the participants go back to their communities to spread the word that Father Chuck’s Challenge is doing God’s work. Father Charles Kennedy joins in the exuberance of the ribbon cutting with a joyful new homeowner. Anthony Celentano of St. Patrick Parish in Malvern was on such a trip in in 2009. His family has been a consistent supporter of Father Chuck’s Challenge ever since Anthony his wife Donna and sons George and Luke went on another such trip last year. Deacon William Williams and his wife Lorraine of Sacred Heart Parish, Havertown, have supported Father Chuck’s Challenge virtually from the beginning. 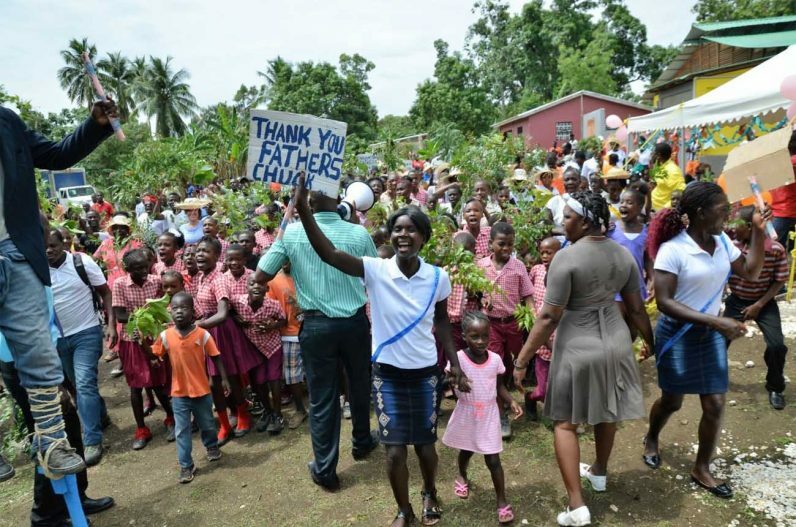 To date Father Chuck’s Challenge has financed 21 villages with 1,122 houses and 90 more in progress, eight fishing boats, 17 community centers, eight two-room schools, two health clinics, 1,958 livestock (mostly chickens), 4,155 fruit trees, nine chapels, three chapel renovations, a radio transmitter and a motorcycle for a circuit riding priest. That’s a big bang for the buck on $5.8 million. While Father Chuck’s Challenge is an ongoing charitable outreach, time necessitates changes. Msgr. Schmidt, who celebrates his 60th anniversary as a priest this year, remains actively involved but has turned the leadership over to Father Charles Kennedy, a friend for many years, who brings with him decades of experience in Hispanic ministry. In the same manner, Theresa Gilmore of St. Philip Neri Parish in Pennsburg has enthusiastically picked up and built on the duties pioneered by Connie Hunt. For more information on Father Chuck’s Challenge see www.fatherchuckschallenge.com or call 267-252-3406. 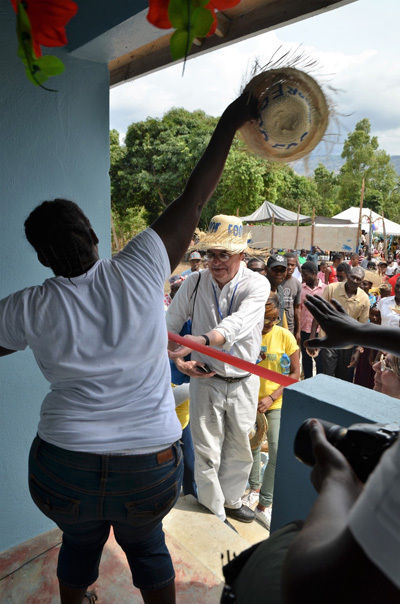 Recipients of new homes by Father Chuck’s challenge in Cupelier, Haiti, show their excitement.